I have avoided buying lamb at the grocery store for years because of the cost. 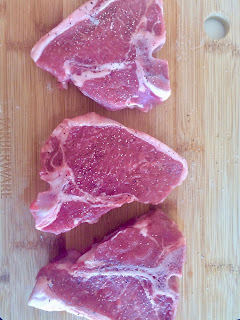 But lamb was always my go-to Easter dinner entree, so when I saw that they had lamb loin chops, I decided to try them. 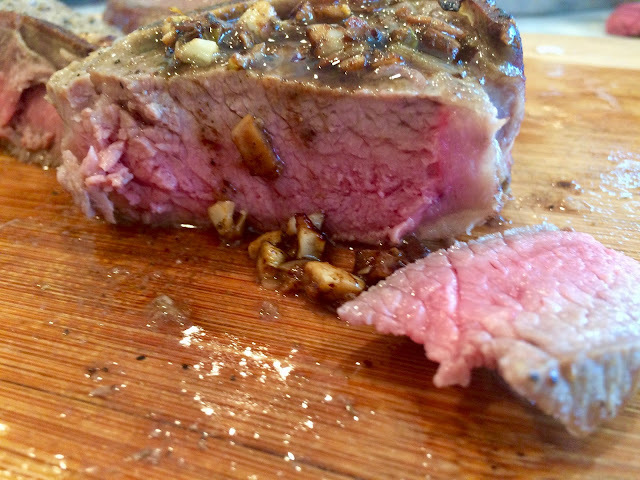 They cost a little bit less than beef for filet mignon, but enough that I certainly didn't want to ruin them! For the record, they're a nice cut. I wouldn't hesitate to buy them again. Plus, they're super easy to prepare and lend themselves nicely to whatever flavors you like. I ran across some recipes that served them with a butter sauce. Um, lamb is not the least fatty meat in the world, so I avoided adding more fat, although I suspect that it's pretty good with butter. Everything is good with butter! The key to a successful lamb loin chop is to not overcook it. Would it be edible if it were well done? Yes, it would. But I'm quite sure it would no longer be as tender as it is at medium rare. I readily admit that I cannot tell whether meat is done by pressing it like everyone suggests. It all feels the same to me. So I rely on my trusty Thermapen which improved my meat cooking enormously! Lamb is medium rare at 145. So as soon as the Thermapen registered 145, it was out of the pan. A huge caveat if you're looking at recipes. They vary enormously on cooking time. I was thrilled that I decided to go by my Thermapen. Had I used any of the times on the recipes I looked at, my meat would have been completely under-cooked or woefully overcooked. 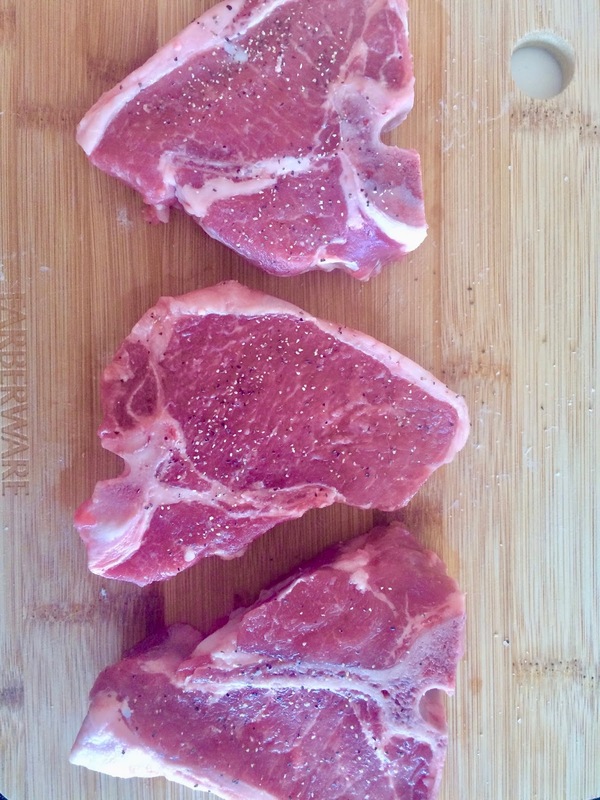 Let's face it, cooking times for meat depend a lot on the thickness of the chop. If you have a temperature probe—use it! I used a cast iron pan. 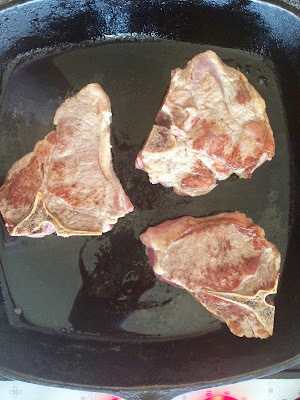 Generally speaking when it comes to red meat, I find cast iron to be preferable. Add olive oil to pan and heat on medium or medium high until a drop of water in the pan will sizzle. Salt and pepper the chops and place them into the pan. Leave them there, untouched (don't flip or move them around) for 3 to 4 minutes while they brown. Flip and brown the other side for 3 to 4 minutes. Continue cooking for another two minutes on each side. Test with temperature probe. You want them to be 145 degrees. Add the garlic and the white wine to deglaze the pan. Continue cooking the chops until they register 145. Remove from pan and allow to rest for at least five minutes. Scrape any remaining bits clinging to the pan and pour over chops to serve. I served these with roasted asparagus and mashed potatoes. Add white wine and garlic. I grew up eating lamb chops and lamb stew, and not just because my father was Irish--my mother liked it too. You're spot on about not overcooking it, because then you get chewy shoe-leather. Recently I was talking to one of the fish-sellers at our local market. Somehow the talk turned to "things we'd never eaten", and it turned out he had never tasted lamb. And all the lamb our market sells seems to come from Australia. But it still tastes good, even if jet-lagged. We have local lamb around here, but it's hard to find in the grocery stores. I haven't had lamb in ages and I love it! Our grocery store doesn't always have it. These look yummy! I love doing a butterflied leg on the grill. I love grilling leg of lamb! Yum! So easy and it's always delicious. Lamb does not need much gilding if it is cooked with care to remain tender. And such a meal is hard to beat. I find some meat prices to be rather high, too, so I choose some days which are meatless, or using on sale chicken in order to balance out my splurge nights. We have regular meatless days, too! That picture really had me, then I read "lamb". I am not a fan of the flavor of lamb at all. 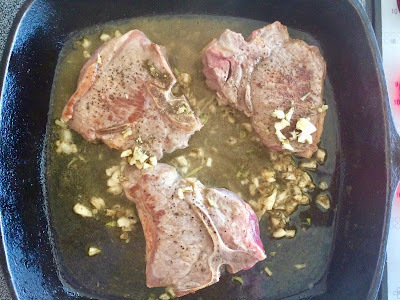 Will try pork chops with white wine and garlic. Usually season with sage, garlic and onion powder so it will be a change. Oh no! 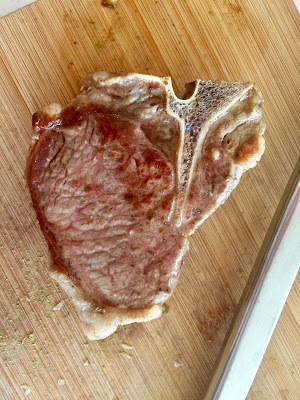 I love pork chops but they always seem so dry these days. We love lamb! I cooked it Easter weekend for my husband's birthday. Your pictures show a perfectly done med-rare. I'm pleasantly surprised that taking them out at 145 degrees they didn't keep heating up to more of a medium, rather than med-rare. I was worried about that, Libby. But I watched the temperature like a hawk and took them out as soon as it reached 145.